From Pulitzer Prize–winning journalist Jesse Eisinger, an account of corporate greed and impunity, and the reckless, often anemic response from the Department of Justice, that asks the question: Why were no bankers put in prison after the financial crisis of 2008? Eisinger is a wonk, and gleefully he wonks out: He examines culprits like Lehman Brothers and laws like Dodd-Frank with equal fascination. But he also fleshes out the backstories of those involved with all the vividness of a biographer ... The book is as alarming as it is comprehensive, but it's also gripping. The unfolding of the financial crisis makes for thrilling drama in Eisinger's hands, heightened by the anxiety still felt by all who survived it. He's even able to make white-collar courtroom proceedings and investigations into tax shelters sparkle. 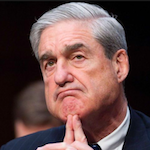 However, with new developments popping daily about Comey and others entangled in Eisinger's tale, the cursory roundup of the Trump era at the end of the book feels tacked on. Still, Eisinger is wise to contain his story to the first decade and a half of the 21st century, which gives him room to dive deeply into the nuance — and the alarming trends — of his topic ... This book is a wakeup call, delivered calmly yet with no shortage of well-reasoned urgency, to a nation whose democratic traditions are being undermined by backroom dealing, deregulation, and the consolidation of corporate power. It's a chilling read, and a needed one. With its broad historical scope, Eisinger’s book lacks the juicy, infuriating details of Chain of Title, David Dayen’s chronicle of foreclosure fraud — another instance of white-collar crime that went largely unpunished. With its emphasis on institutions and incentives, it doesn’t serve up the red meat of Matt Taibbi’s The Divide, a stinging indictment of the justice system’s unequal treatment of corporate executives and street-level drug offenders. But for someone familiar with the political landscape of the contemporary United States, Eisinger’s account has the ring of truth ... Many people simply want to live in a world that is fair. As Eisinger shows, this one isn’t. 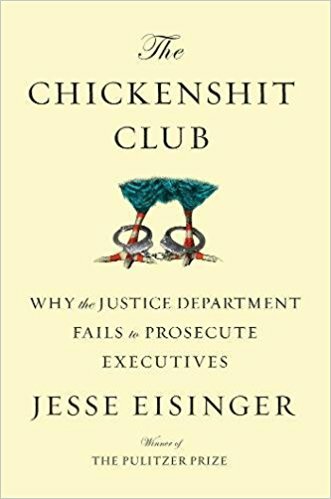 The Chickenshit Club is an admirably lucid, nuanced book about the tangle of complicated changes that, over the past decade or so, converged to make the DOJ less bold and less capable in its pursuit of corporate criminals ... As much as I was learning, I wanted to feel more like I was inside Eisinger’s head, following along with his thought process as he reported out his story and got to know and understand its main characters. More than that, I wanted him to show me the buildup of the passion that fuels his book—how he came to believe in the ideas he argues for in it and how he learned the system well enough to authoritatively evaluate its breakdown ... It’s no insult to Eisinger’s explanatory powers to say that the financial crimes he describes in the book are extremely hard to grasp...One way Eisinger could have compensated for the opacity of white-collar crime—one way he could have made the more confusing parts of the narrative more viscerally bracing—would have been to insert himself more into the story...having a little more Jesse Eisinger in The Chickenshit Club would have made the book more accessible. It could have also created room for Eisinger to engage in a less inert, more discursive mode as he felt his way toward the truth. What did you think of The Chickenshit Club: Why the Justice Department Fails to Prosecute Executives?